A healthy version of a classic breakfast dish! Makes 4 servings. 1 tortilla per serving. Lightly brush tortillas with oil on both sides and place on a baking sheet. Bake for 5 to 10 minutes or until tortillas are crisp on the edges and starting to brown. Remove from the oven and set aside. Pour egg substitute into skillet. Cook over medium heat for 2 to 3 minutes until eggs are cooked through. 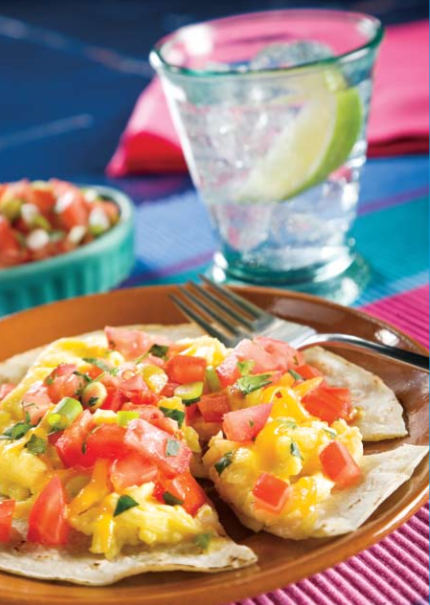 Place an equal amount of eggs on each tortilla and top each with ½ tablespoon cheese. Place under the broiler for about 2 minutes until cheese is melted. Spoon ½ cup Fresh Salsa on each tortilla and top with ground black pepper.